Eriodictyon californicum (H. and A.) Greene. Other common names: Mountain balm, consumptive's weed, bear'sweed, gum plant, tarweed. Description: This evergreen shrub, a member of the waterleaf family (Hydrophyllaceae), reaches a height of from 3 to 4 feet, bearing glutinous leaves. The stem is smooth, but exudes a gummy substance. The dark-green leaves are from 3 to 4 inches in length, placed alternately on the stem, oblong or oval lance shaped, leathery, narrowing gradually into a short stalk, and with margins generally toothed, except perhaps at the base: the upper surface is smooth, with depressed veins, the prominent veins on the under surface forming a strong network and the spaces between the veins covered with short felty hairs, giving it a white appearance. The leaves are coated with a resinous substance, making them appear as if varnished. The rather showy whitish or pale-blue flowers are borne in clusters at the top of the plant, the tubular, funnel-shaped corolla measuring about half an inch in length and having five spreading lobes. The seed capsule is oval, grayish brown, and contains small, reddish-brown, shriveled seeds. Collection, prices, and uses: The leaves are the parts collected for medicinal use and are official in the United States Pharmacopoeia. The price paid for them is about 5 cents a pound. 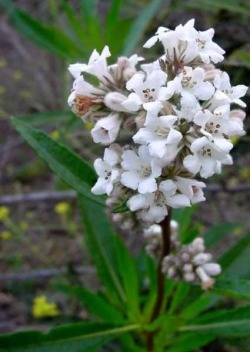 Yerba santa has expectorant properties and is employed for throat and bronchial affections. It is also used as a bitter tonic. The odor is aromatic and the taste balsamic and sweetish.